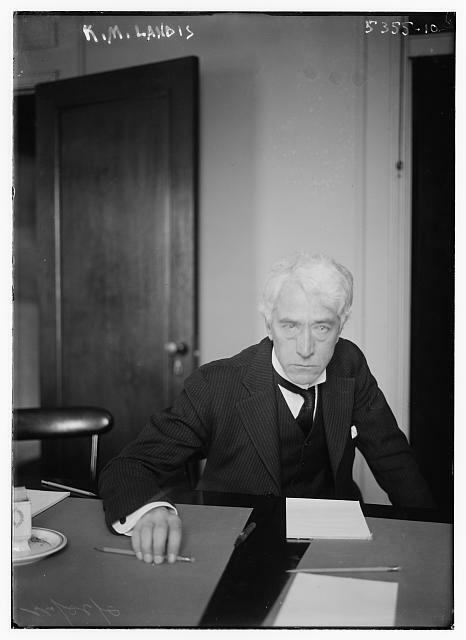 Kenesaw Mountain Landis (1866 - 1944) served as a judge for the U. S. District Court, Northern District of Illinois from 1905 to 1922. Landis was appointed to be the first commissioner of Major League Baseball in 1921 and he served as commissioner until 1944. In 1919 Landis was the trial judge in a case with interesting political ramifications that also drew Clarence Darrow's attention. The case involved Victor L. Berger, a Socialist politician from Wisconsin and four other Socialists who were indicted under the Espionage Act in February 1918. Berger was a founding member of the Socialist Party of America and an influential Socialist journalist. In 1910, he became first Socialist elected to the U.S. House of Representatives when voters in Milwaukee elected him. In 1918 while under federal indictment, Milwaukee voters again elected Berger to the House of Representatives. In February 1919 Berger and the other four defendants were convicted of violating the Espionage Act because of their opposition to the entry of the United States into World War I. Landis presided over the trial and he sentenced Berger to 20 years in federal prison.